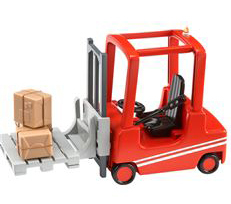 The Postman Pat SDS Forklift truck was first released in a multipack set of four vehicles in 2010. In 2011 it was released by Character as a single vehicle and accessory set. Accessories included with the SDS Forklift are the three wrapped brown parcels. Load these onto the SDS Forklift and lift the moveable pallet up and down.